Agrostemma githago (Common corn-cockle) flower. The flower has five pink petals fading to white near the base, then a darker pink area at the base. Each petal is marked with three or four dotted lines reaching about half to two thirds of the petal's length. 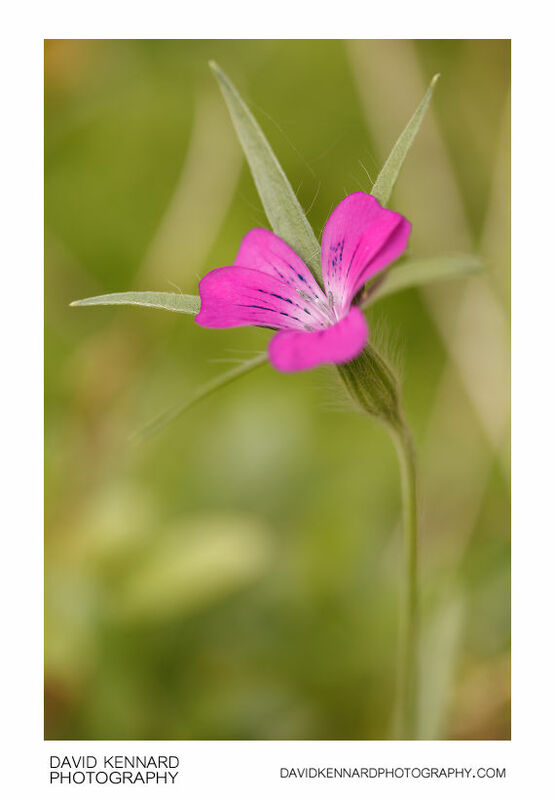 The flower has 5 long, narrow green sepals, which are hairy on the underside. The sepals are joined together for about one third of their length, forming a tube at the the base of the flower. In the past the Common corn-cockle was a common weed growing in wheat fields. However, with the modern farming methods of planting winter wheat, the wheat is harvested before the corn-cockle can set seed. This has resulted in a great reduction in the plant's number - it was thought to be extinct in the wild in the UK until recently.